This week over the the Friday Mashup Challenge blog, the challenge is to create a project using the colours Melon Mambo (fuschia), Wild Wasbi (pale garden green), black, and white, or to create a project using wood elements, or mash it up and create a project with the colours and wood. The Friday Mashup challenges really get my wheels turning! 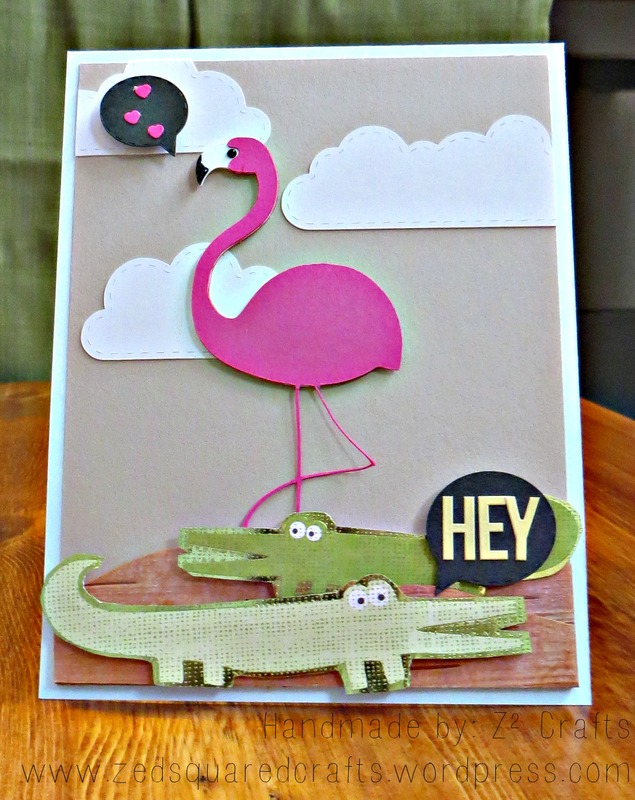 My inspiration for this card actually came from last week’s FM171 Rockstar, Bridget at Kritter Crafts. I had some scarps of birch bark (woof!) that I had left over from a project I did back in July, so I started with those. Next I pulled out papers in the challenge colours to plan the layout. I cut the crocodiles from a 12X12 paper pad MAMBI, Oh Baby Boy. I left a border around each croc because the paper was metallic and I thought it would add a little “razzle-dazzle” to the project. After I played around with the papers and decided on using a flamingo and crocs, I drew a quick sketch and hopped over to my computer to start work in Silhouette Studio. I cut the clouds, flamingo, and speech bubbles using my Silhouette Portrait. I assembled the flamingo and added an eye using a small black enamel dot, and Glossy Accents on the beak and then set it aside to dry. Using my scissors, I cut a 2X4″ piece of the bark in two with a wavy line and then glued (Tombow Liquid Glue) the two sections in layers onto my card’s background cardstock. I used clothespins to hold it together while it dried. Next, I lined up beige Kelly Purkey letter stickers on the larger speech bubble to create my sentiment. I punched some tiny hearts in the same colour as the flamingo and adhered them to the smaller speech bubble. The last thing I did was to assemble the whole card. I adhered the clouds using my Zig 2 Way Glue pen directly to the background and trimmed the edges where the clouds overhang. I then positioned my critters and adhered them down with foam tape. Finally, I used two layers of foam tape to adhere the speech bubbles. I can’t wait to see what the FM gals have in store for us next week. Thanks for dropping by! Last week I had a blast playing along with friendly folks over at the Colour Me…! Challenge Blog. This week, I had even more fun experimenting with different ways to add monochromatic colour to my card. So, the CMCC #32 this week was to create a project using only one colour, Pistachio Pudding. I’ve mentioned before that I am new to the crafting scene, so I had to scrounge in my stash to find some paper (or anything at all!) that was close to the Stampin’ Up colour. What I found, was a single piece of My Mind’s Eye 6X6 patterned paper with a pale green chevron. 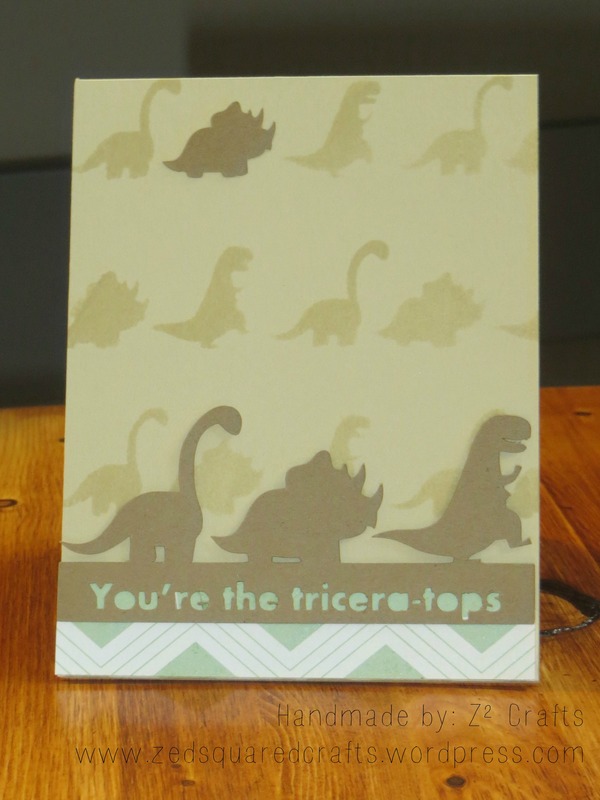 I actually made a card using just neutral and that patterned paper that I will show at the bottom of this post. After my first attempt, I realized that I wanted more options with the colour so I popped over to my local Home Depot and selected a few paint swatches that were close in colour to the green of my lonely chevron paper. I liked the Behr swatches best because they were the largest (about 3½X6½”). Also, FREE…I love crafty scrounges. 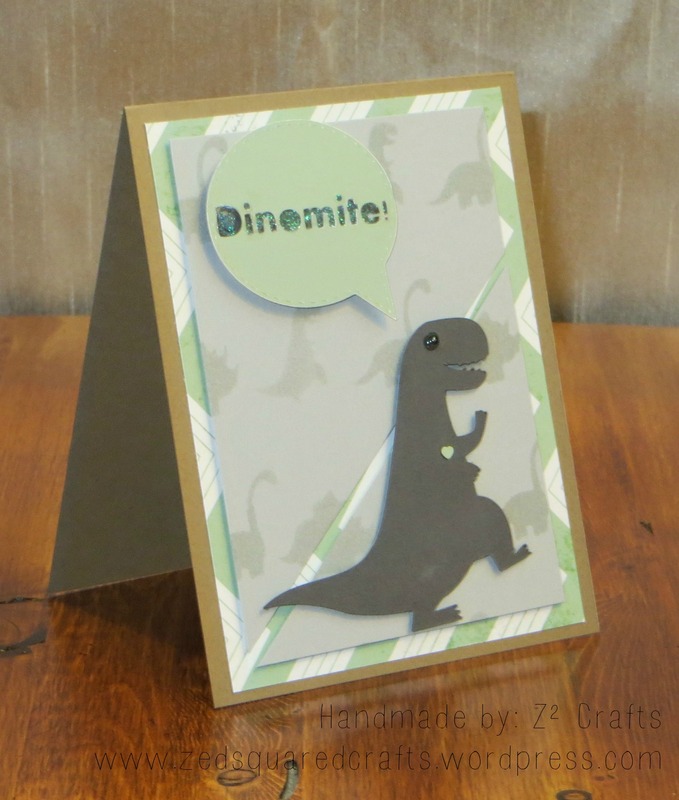 I bought a dinosaur file from Silhouette this week, so I’ve had dino on the brain. I’m still using up the $10 that came free with the machine and from time to time will buy something new to inject a little creativity into my projects. To make my CMCC#32 card, I started by making a stencil in Silhouette Studio by lining up rows of dinosaurs that were about 1″ high. I cut the stencil out of scrap cardstock. 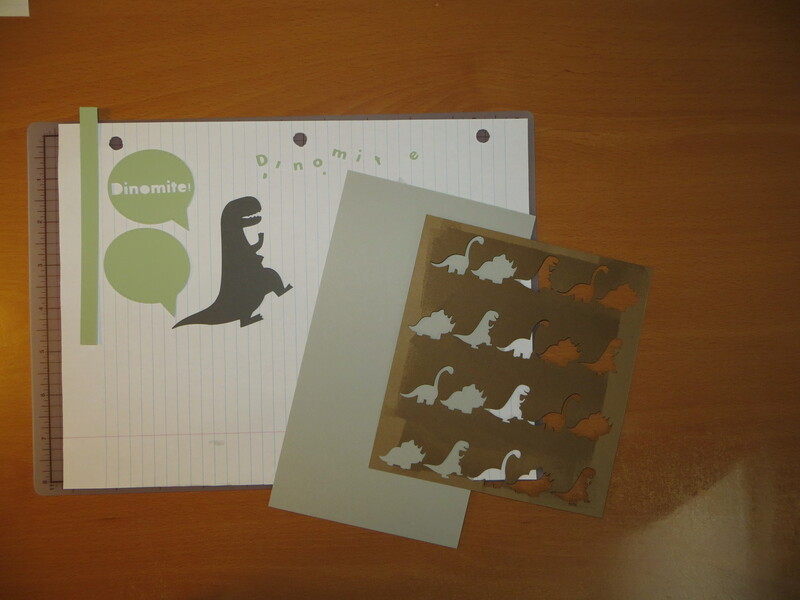 Next, I cut the t-rex out of a heavy grey cardstock. I slowed my machine way down because of the weight of the paper, and detail of his teeth (1cm/sec). The last thing I cut was the ‘dinomite!’ speech bubble using one of my paint chips. I struggle with photographing my cards, so the photo doesn’t show it, but there is a perforated line (“stitched”) cut just inside the speech bubble. In real life it adds a small detail. Below is a picture of everything I cut from the Silhouette. My homemade dinosaur stencil cut from my Silhouette Portrait. I used a piece of light grey cardstock and my homemade stencil with Versa Watermark Ink to create the soft background. I trimmed my patterned paper to about 4X5¼” and adhered it to my craft cardbase with my tape runner. After letting the ink dry, I trimmed my stenciled background to 3¾X5″ and then right through the centre on a diagonal. I used foam tape to adhere the two background triangles to the cardbase. I punched a tiny heart from the paint swatch and adhered it with Tombow Mono Liquid Glue to my dinosaur. I then used a tiny black embellishment, a silver maker and Glossy Accents to make the eye. Once the eye was dry, I adhered the dinosaur to the card using foam tape. I decided to use the speech bubble with the ‘dinomite!’ cut out, and adhered a piece of the dark grey cardstock behind the sentiment. I used two layers of foam tape to adhere the speech bubble to the card. I did go back afterwards and add some sparkles (pale green) and Glossy Accents over the sentiment. I think if I did this card again I would skip this step. The final card is very cartoony with plenty of dimension. Perfect for my baby nephew. This was my first attempt at the monochromatic CMCC#32. My card was chosen as a Colour me…Colour Connoisseur this week. Thanks DT! I made a card this week for a coworker whose wife just had a baby girl. I wanted to share this one because the embellishments look fancy but were easy-peezy to make. Sweet new baby card with homemade flower embellishments. The background was simple. I used a piece of white cardstock and scored along two diagonals to make the bottom section. The top section is a piece of pink patterned paper (from Stampin’ Up) with a layer of vellum over top. I used a strip of pink polka-dot paper to cover the seam and make the card look more finished. I cut the sentiment and frame with my Silhouette machine. I handmade my flower embellishments. They are surprisingly really easy to make. Start by punching, or like mine, cut from the Silhouette, three 5-petal flower shapes per finished embellishment. For this card, I cut nine flowers of the larger size, and nine of the smaller size using my Silhouette. Next, I lay all the flowers down and smushed Archival Brilliance, Platinum Planet ink over each one. While the ink was still wet, I used my fingernail and bone folder to shape the petals by folding in. I repeated shaping the petals for all 18 flower layers. It really didn’t take that long at all. You kind of just get into the groove of it after about the second one. Your fingers do get inky so keep a baby wipe handy. I cut two sizes of leaves in green and smushed just a little bit on the ink of each one. For the leaves’ shape, I scored the vein marks with my bone folder and then gently folded in. I adhered three layers of flowers to make each embellishment using Tombo Mono Liquid Glue in between each layer. I let them dry by using a clothespin to hold each one together. After about five minutes, I finished off each one with some pearls in the centre and then touched up the petal’s shapes. I assembled my card by adhering the frame with foam tape and then a combo of pop dots and Glossy Accents for the embellishments. One last tip, if you use five layer of the 5-petal shape and fold them in around a pencil, you will get a rose looking flower.